...that the Arbiter can be seen meleeing while dual wielding in Halo 3? Installation 03, also known as Gamma Halo, is one of the seven ring-shaped superweapons that comprise the Forerunners' Halo Array. Located in the Khaphrae system in the Scutum-Centaurus Arm of the Milky Way galaxy, Installation 03's monitor is 049 Abject Testament. The ring appears to have a red and cracked surface, indicating the presence of vast deserts and volcanic activity, but it also features jungles. Although Installation 03 was originally anchored in orbit around a gas giant for the firing of the Array, by the time of its discovery by humanity in the twenty-sixth century, it orbited a rocky planet, the face of which had been shattered as a result of a fairly recent impact event; the debris from the impact, still aglow as of 2557, has collected to form a dense asteroid field in orbit over the planet as well as the Halo. The Forerunners had Installation 03 constructed by the Foundry of Installation 00 approximately around the same time as the rest of the Halo Array, circa 97,445 BCE during the Forerunner-Flood war. The array was designed by the Forerunner Builders to combat the parasitic Flood by eradicating them and all sentient life in the Milky Way. After the rings were built, Installation 03 and its fellow Halos were distributed from Installation 00 to positions across the galaxy through slipstream space portals. Afterwards, the Halo Array was fired and eradicated all sentient life from the galaxy. 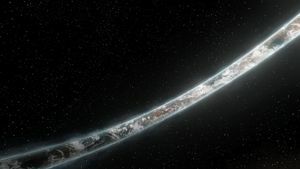 The Forerunners proceeded to reseed the galaxy with life from the species that were preserved on the Halo installations. Like its fellow installations, Installation 03 became home to dormant specimens of the Flood that were intended to be used to help find a cure to the parasite in the future. With the Flood defeated, the surviving Forerunners exiled themselves from the galaxy. "Fail-safe protocol: In the event of unexpected shutdown, the entire system will move to standby status. All remaining platforms are now ready for remote activation." During the Battle of Tribute in August 2552, the freighter Floral Express fled the planet while carrying colonial refugees. Following a random slipspace trajectory per the Cole Protocol, the ship arrived near Installation 03 on October 8. Upon returning to Earth, the crew was detained by the Office of Naval Intelligence for possible violations of the Cole Protocol. After examining Express's flight records, based on intelligence gleaned from the Battle of Installation 04, ONI contacted and redirected pioneer teams to the Khaphrae system. Soon after confirming it was Installation 03, the teams attempted to find and secure the installation's Library to recover the activation index as part of neutralization protocols established by October 25. Since Earth was under attack at the time, the teams could not return home, and they did not have the force of arms to remain on the ring, the teams settled in for a long habitation in a makeshift orbital base which they named Ivanoff Station. On November 3, 2552, during the Battle of Installation 05, Chieftain Tartarus of the Covenant activated Installation 05, though United Nations Space Command and Sangheili forces managed to terminate the firing sequence before the Halo could fire. As per fail-safe protocol in the event of an unexpected shutdown, a signal was sent to Installation 03 and the rest of the Halos from Installation 05, placing all Halos of the array on standby mode, ready for remote activation from Installation 00. A readout from Installation 05's control room showed that Installation 03 was fully prepared to fire on demand. However, during the Battle of Installation 00 on December 11, 2552, the UNSC and allied Sangheili forces fought to prevent the Covenant from firing the Halo Array from the Ark, as Installation 01 and its fellow Halos were still in standby mode and was prepared to receive the signal to fire. Eventually, Master Chief Petty Officer John-117 succeeded in deactivating Installation 03, as well as the rest of the array, before it could be fired. Shortly after the end of the war Ivanoff was expanded into a permanent UNSC facility. In March 2553, Dr. Catherine Halsey was indefinitely detained there by Admiral Margaret Parangosky, CINCONI, as retribution for lying to the admiral about the creation and deployment of flash clones during the SPARTAN-II program's early phases. Spartan teams were deployed to reconnoiter the surface, to quarantine areas of potential Flood contamination, and to recovery any notable Forerunner artifacts. The PIONEER-class Mjolnir variant first saw field use during these exploratory deployments. In March of 2555, monitor 000 Tragic Solitude of Installation 00 utilized a captured human to activate the Halo Array's firing sequence, triggering a countdown set for the Halos firing in five weeks from March 8, 2555. After discovering the countdown on Installation 07, the UNSC and Swords of Sanghelios launched a joint operation to Installation 00 in which a team destroyed Tragic Solitude and ended the Halo Array's firing sequence. "Even now, your kind tinkers with the Composer in the shadow of the third ring. Children and fire, who disregard the welfare of the galaxy." — The Ur-Didact about the human activities in and around Gamma Halo. The Composer being extracted from the surface of Installation 03 by UNSC Infinity. The ONI science teams retrieved various artifacts from the surface of Installation 03 and brought them on Ivanoff Station for study, including the installation's activation index, a war sphinx's "eye", and a Composer. An accident with the Composer killed the team researching the device; however, it provided coordinates which led the UNSC Infinity to the shield world known as Requiem. When the Ur-Didact was awakened, he traveled to Ivanoff in his ship Mantle's Approach and acquired the Composer on July 24, 2557, using it to digitize Ivanoff's staff before jumping into slipspace to travel to Earth to use the recovered weapon on humanity's homeworld. However, SPARTAN-117 and Cortana followed the Didact into slipspace in an F-41 Broadsword in hopes of foiling his plan, ultimately defeating him. By the time of the Didact's attack, SPARTAN-II Black Team had been assigned to Gamma Halo, along with a research attaché. The science team established a camp in one of the Halo's deserts. On July 25, Team Black and the scientists were killed by the Didact and his Promethean machines, who had been flung to the Halo through a slipspace portal aboard Mantle's Approach during the New Phoenix Incident. Around the same time, 859 Static Carillon, the monitor of the Composer's Forge, attempted to contact Gamma Halo's monitor after a service portal between the Halo and the Composer's Forge was reopened. Receiving no response, Static Carillon traveled through the portal to the Composer's Abyss on Installation 03, where he encountered the Didact. At the Promethean's request, the monitor led him to the portal to the Composer's Forge, on the condition that the Didact would not use the Composers to create more Promethean Knights, as Static Carillon considered the constructs "abominations". A section of Installation 03 is ejected toward the Composer's Forge. 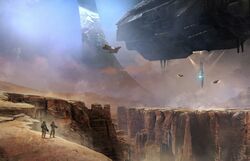 During these events, Covenant forces landed in a jungled region of Gamma Halo where they took the artifact known as the Conduit to a Forerunner structure they termed the Altar in order to open slipspace portals all over Gamma Halo and take control of the ring. One of these portals was opened by way of a mysterious machine located in the jungle. A large number of UNSC forces, including Marines and a Spartan Headhunter, were sent to the Altar to reacquire the Conduit in tandem with a lone Spartan-IV who was deployed to the jungle to investigate the machine. After securing the Conduit, the Spartan Headhunter was redeployed to Earth in hopes of using the Conduit to deter the subsequent Promethean invasion of New Phoenix with help from ONI scientists and eventually the other Spartan. On July 25, 2557, Blue Team arrived on Installation 03 to investigate the loss of contact with Black Team on Admiral Terrence Hood's orders. Upon discovering the fate of Black Team and the scientists, and destroying some of the Knights responsible for the massacre, they soon came across the Composer's Abyss and the slipspace portal within. Entering the service portal, Blue Team arrived at the Composer's Forge, where they encountered the Didact, who summoned an army of newly-created Promethean machines to attack them. At the Didact's request, 859 Static Carillon transported Installation 03 through slipspace to orbit over the planet housing the Composer's Forge. However, Static Carillon also turned on the Didact and allied with Blue Team, as he felt betrayed by the Didact because he had broken his promise to the monitor not to produce more Prometheans. The Didact used the portal to return to Gamma Halo, taking one of the Composers with him. Blue Team followed in close pursuit and were confronted by the Didact again at the top of the Composer's Abyss. Though the Spartans were nearly killed by the Didact, Static Carillon arrived to the site just in time to save them, incapacitating the Didact and sending him into Gamma Halo's control room by utilizing the local teleportation grid. Wielding Gamma Halo's Activation Index which the Didact had dropped when the monitor ambushed him, John-117 followed the Didact into the control room with Static Carillon's help while the other Spartans returned to their Longsword. The Master Chief used the Index to give 859 Static Carillon control of Gamma Halo, enabling the monitor to detach the segment of the ring housing the control center. This caused massive cracks to appear in the landscape surrounding the removed plate. Static Carillon was momentarily preoccupied with stabilizing the Halo as the plate's sudden removal would have otherwise resulted in the ring's destruction. Although the plates on both sides of the removed portion were not immediately connected, thus closing the loop of the ring, Gamma Halo was able to maintain structural integrity. After teleporting John-117 to safety just as the removed fragment impacted the Composer's Forge and destroyed it, Static Carillon took Installation 03 for safekeeping and repairs in an undisclosed location. By October, 2558, Gamma Halo's new location was still unknown by the UNSC, with its Activation index being kept by ONI in a undisclosed location. In Halo 3's texture files, Installation 03 is named "Eta Halo", while the designation "Gamma Halo" is given to Installation 06. This is contradicted by one of the audio logs in Halo 4, (as well as the Eleventh Hour reports), which identify Installation 03 as "Gamma Halo". Since the name assigned to the ring in Halo 4 is conveyed in released media, it is considered to override the previous designation, which was never seen outside Halo 3's files. The symbol representing Installation 03. Hologram of Installation 03 seen on Installation 00 in Halo 3. John-117 gazing upon Installation 03 in Halo 4. Another view of Installation 03. The destroyed planet around which Gamma Halo formerly orbited. Blue Team's Longsword over the Halo. A desert on Installation 03. A look at the ring. A human science camp in a desert on the Halo's surface. Black Team discovering the unconscious Ur-Didact on the installation. The entrance to the Composer's Abyss. 859 Static Carillon detaches a segment of the Halo, damaging the surface of the ring. A hologram of Installation 03 in Halo: Spartan Strike. A Pelican near Gamma Halo. A Spartan fighting Prometheans in Gamma Halo's jungles. A Forerunner structure in the Altar's vicinity. A map of a location on Gamma Halo in Halo: Spartan Strike. A map of the Altar's immediate region in Halo: Spartan Strike.